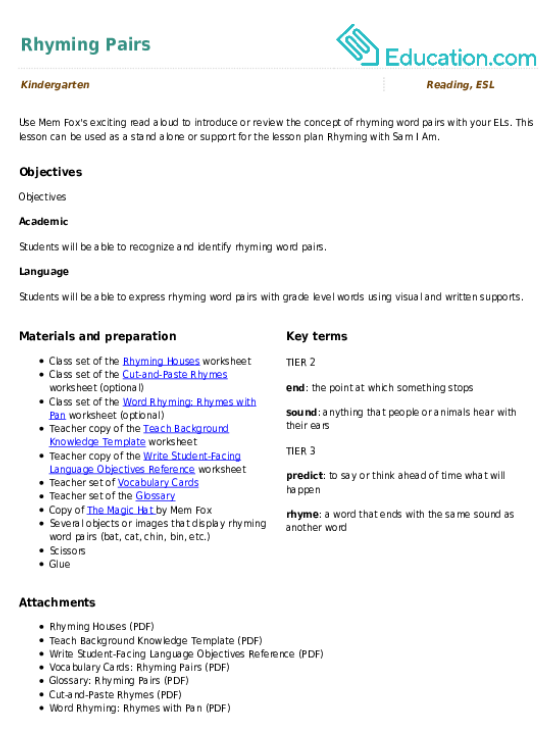 This lesson can be used as a pre-lesson for the Rhyming with Sam I AmLesson plan. Students will be able to recognise and identify rhyming word pairs. Students will be able to express rhyming word pairs with grade level words using visual and written supports. Display one of the objects or images of rhyming pairs that you collected for this lesson. Hold one of the objects up and ask the class to say the objects name aloud (e.g., cat). Repeat with the rhyming object (e.g., hat). 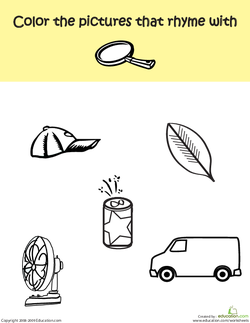 Tell the class that these two objects/pictures rhyme. Explain that today they will be practising finding rhyming words, or words that end with the same sound. 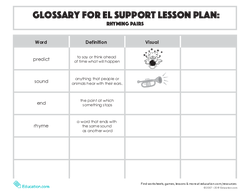 Introduce or review the new vocabulary words by providing student-friendly definitions using the Vocabulary Cards and Glossary for support. Ask students to turn and talk to share a word that rhymes with bat. Have a few student pairs share out their rhyming word pairs aloud as you record them on the board. Point out how all of the words end with the same AtSound. Read aloud the text The Magic Hat By Mem Fox, pausing as you read to note the rhyming word pairs. As you read, encourage students to predict the next rhyming word before you turn each page. Record the rhyming pairs on the board as you read. Explain that students will now get to practise matching rhyming words on their own. 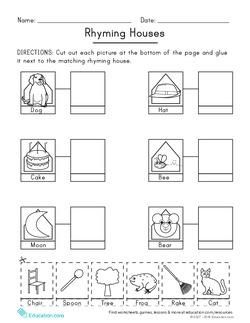 Pass out the Rhyming Houses worksheets and materials (scissors, glue) to each student. 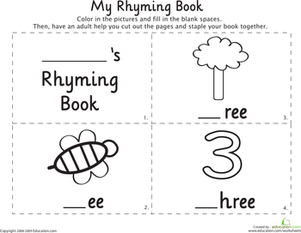 Work with a smaller group of students to listen for the rhymes to complete the Word Rhyming: Rhymes with Pan worksheet. Practise listening for rhymes as you reread the story. For students who finish early or need an additional challenge, have them complete the Cut and Paste Rhymes worksheet. Have students create their own rhyming pairs pictures to demonstrate their understanding of rhymes. As students are working independently, check that they are able to demonstrate their understanding by matching each word with the correct rhyming word. Check that students can communcate their rhyming word pairs with a partner during the closing activity. 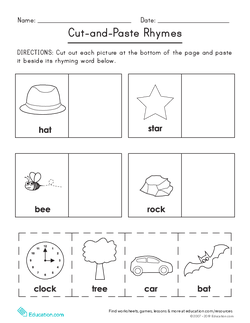 Close by answering any questions and reviewing rhyming words from the Rhyming Houses worksheet and/or story. As an exit ticket, have students turn and talk to share a word that rhymes with dog or pin. Then, have them share their word aloud. Use Mem Fox's exciting read aloud to introduce or review the concept of rhyming word pairs with your ELs. Let's do some rhyming! Your little one can match up each pair of pictures that rhyme, a great way to build his phonics skills.